At Macro Ops we like trades where a confluence of positive tailwinds intersect with a thematic that has a long runway. Opportunities where attractive valuations spawned by negative to neutral sentiment combined with improving fundamentals and accelerating momentum are what we look for. One of our current holdings checks all these boxes. 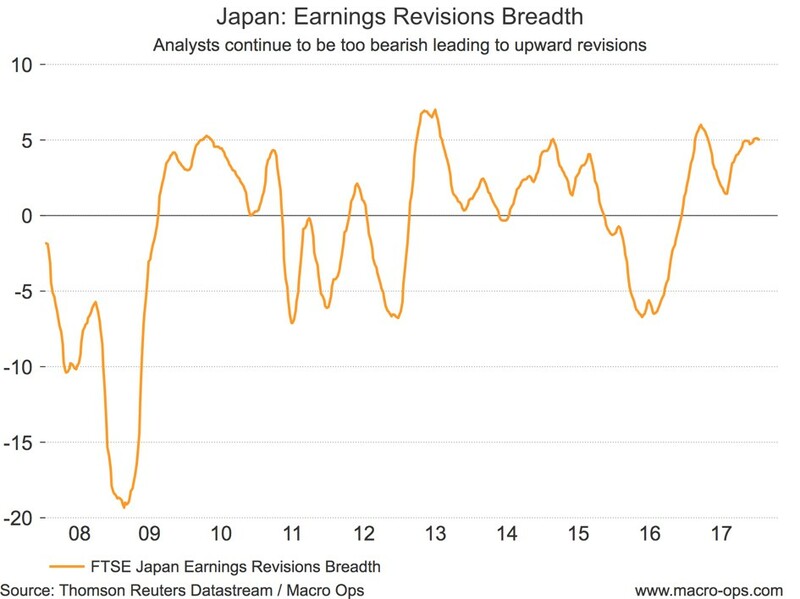 I’m talking about Japanese equities. 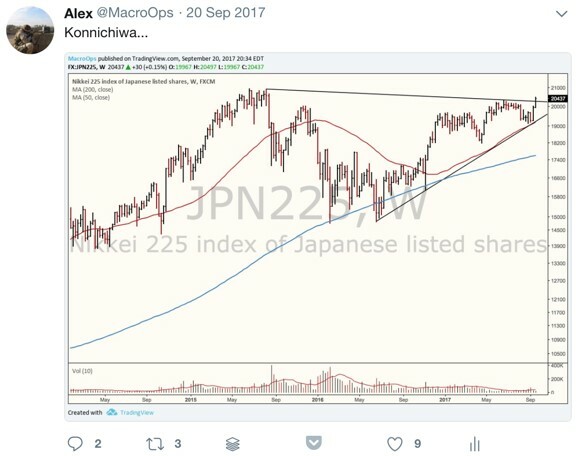 A theme we’re playing using futures on the Nikkei (DXJ is the ETF alternative). 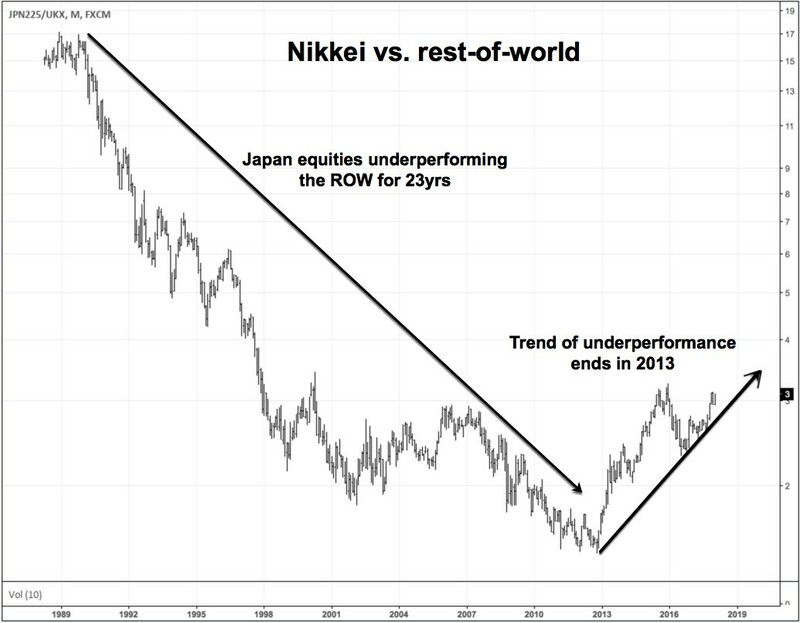 The Nikkei has had a good run since it first popped up on our radar back in September. But this move is only getting started. 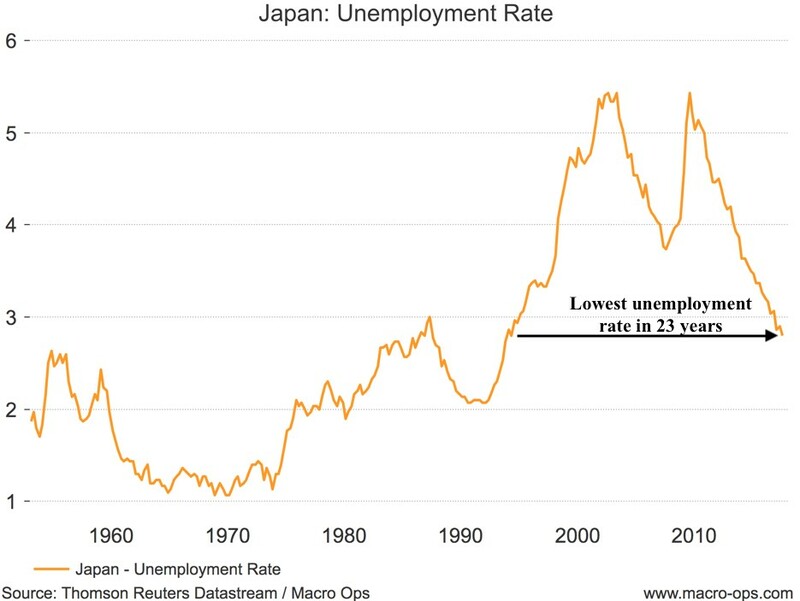 Here’s why it’s time to be long Japan. While the US and European markets have been getting all of the attention. 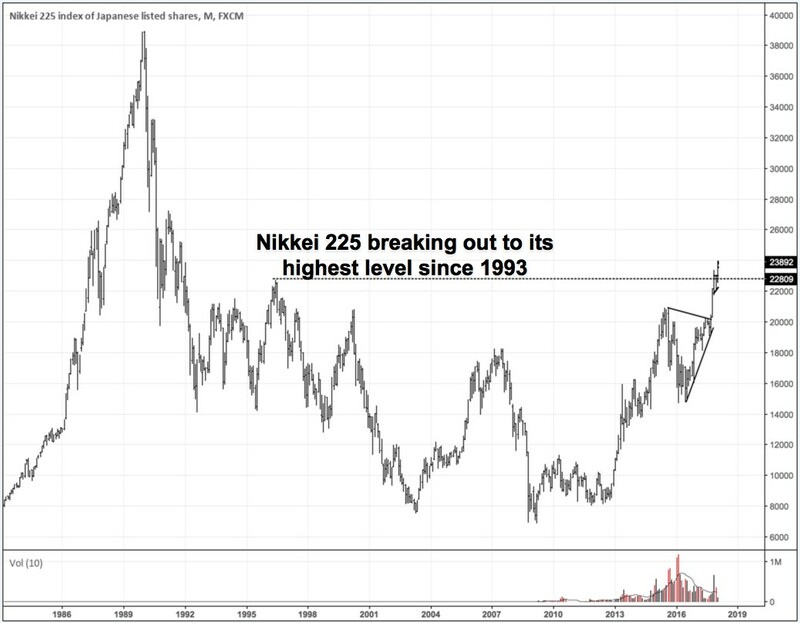 The Nikkei has quietly made new multi-decade highs. 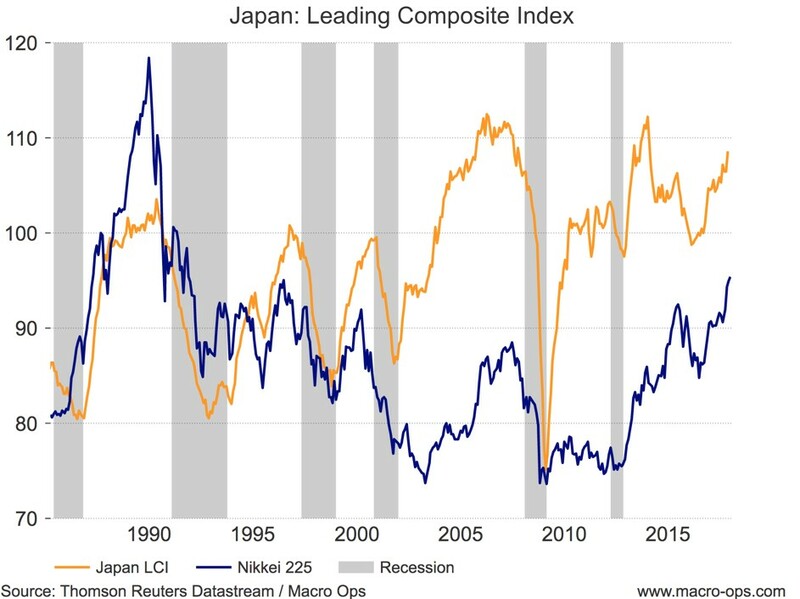 And after underperforming relative to the rest of the world (ROW) for decades, the Japanese market has been rising faster than global stocks as a whole since 2013. Relative momentum is an important factor. It makes plainly visible the large trends created from global capital flows. These trends, once started, have a tendency to persist for years. Behind this improving tape is one of the best looking fundamental backdrops of any advanced economy. 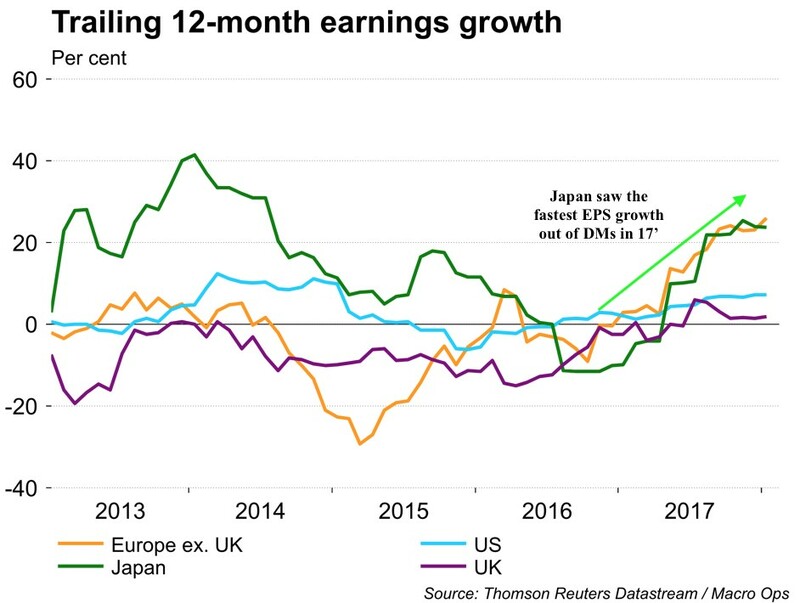 Japan had the fastest increase in earnings growth of all the major stock markets in 17’. Net profits for Topix companies increased 35% Y/Y in the first half of fiscal year 18’. And the market continues to be overly pessimistic on earnings estimates. This is resulting in forecasts having to be continuously revised higher. It’s steady positive surprises like these that drive bull markets (the market climbing the proverbial wall of worry). 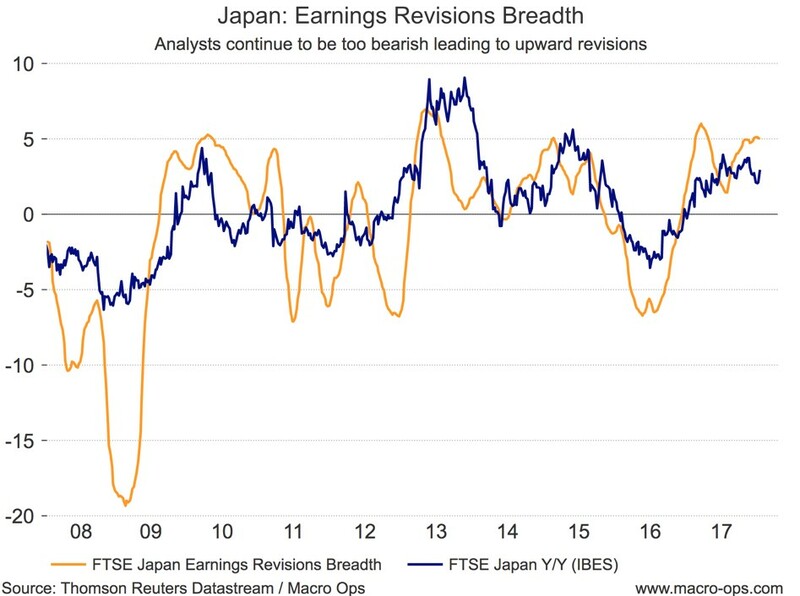 Here’s the same chart along with FTSE Japan on a Y/Y basis, showing earnings surprises (both positive and negative) leading stock returns. We expect this positive fundamental momentum to accelerate in the year ahead. 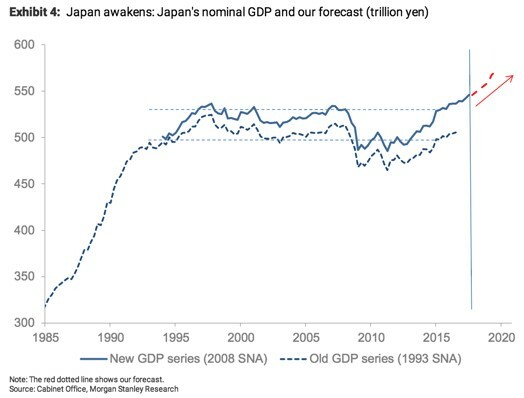 After years of stagnation, Japan is finally seeing its nominal GDP make new highs (chart via Morgan Stanley). 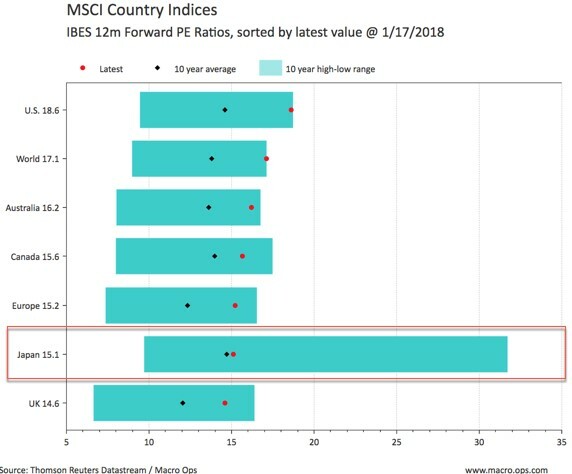 Its Leading Composite index (LCI), a composite of 12 indices measuring the country’s economic and financial health, has been strongly trending higher since 2015. This signals robust economic momentum that should continue into the foreseeable future. We can see this improving economic momentum across the board. 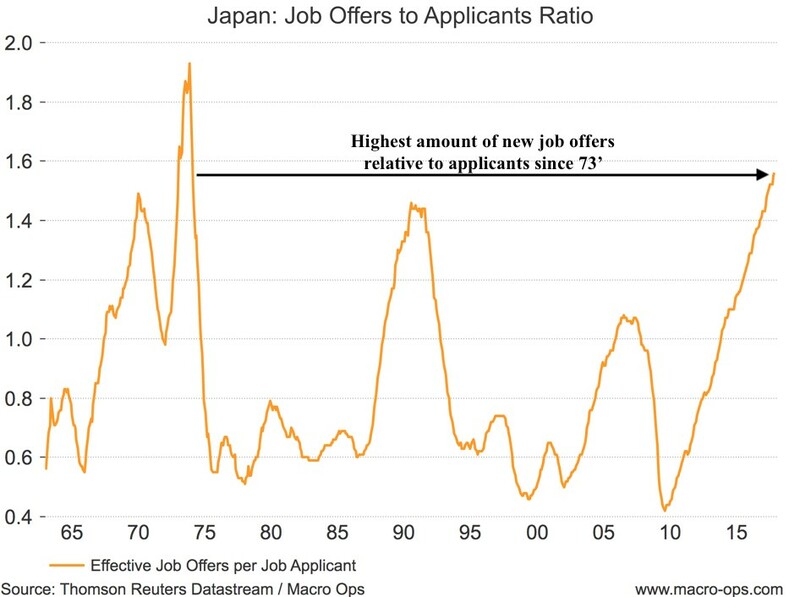 The Tankan business conditions survey recently saw its most positive results in over 20+ years. Employers are on a hiring binge. The labor market is the strongest it has been in 23 years. In addition to this great trifecta of low valuations, negative to neutral sentiment, and improving fundamental backdrop, there are a number of catalysts that are set to drive this trend onwards and upwards. In December, the Japanese ruling coalition approved a draft for a significant tax package (surprisingly, it’s received little attention in the press). The aim of this tax proposal is to incentivize corporates to raise wages and increase capex spending. If passed, it would lower the effective corporate tax rate to as low as 20%, down from 30% where it currently sits. The law would allow large corporates to reduce their effective corporate tax rates to 25% if they raise wages by more than 3% as well as expand investment. The 25% rate could be reduced further, to the minimum 20%, if companies invest into new technologies that are related to the Internet of Things (IoT). If this proposal gets passed into law (we think it will be, albeit with some minor changes), it will take effect this fiscal year and run for three years. This would be huge… Japanese public companies have a lot of cash (estimates put it at close to 120tn yen) sitting on their balance sheets. That’s a lot of cash that could potentially be put to work in the real economy. There’s also a number of positive macro tailwinds, such as a likely fiscal/infrastructure boost in spending as Japan prepares for the coming 2020 Tokyo Summer Olympics. Not to mention, accelerating economic/business ties between Japan and mainland China. China is seeing rising labor costs and so is turning to Japan for robots, amongst many other high-value items. If you don’t own any Japanese stocks, you might want to rethink that. In a follow on piece, I’ll talk about a few Japanese stocks we’re tracking which have large upside potential.